I don’t know about you, but when I discover that a favorite food of mine has a secret life I was previously oblivious to, I tend to get a little irrationally excited. It happened when I discovered coffee could be consumed in solid form; it happened when I discovered olives were for more than just snacking with cocktails, and it happened when I discovered, on my first and only trip to the enchanting island of Bali, that avocados are just as good in dessert as they are in sandwiches, salads, dips and California rolls. It did, admittedly, take me about a week of seeing it on menus before finally deciding to take the after-dinner avocado plunge. It wasn’t that I didn’t trust local tastes – on the contrary, everything we ate, without fail, was amazing. It was, rather, my culinary narrow-mindedness finally catching up with me. You see, avocados, along with tomatoes, peppers and eggplant, belong to that strange category of fruits that all of us who grew up with the Anglo-Saxon culinary mindset prefer to consider vegetable. Chocolate mousse with tomato coulis? Green pepper tarte tatin? Ugh. Even if we may be more than happy to eat certain vegetables in roles normally reserved for fruit – rhubarb, sweet potatoes and carrots, for instance – these transvestites of the produce world will no sooner be decorating a pot de crème or filling a cake of ours than lamb brains and pickled chicken feet. In fact, as I worked up the nerve to order avocado for dessert that very first time I realized how just how deep my prejudices go – while I’m normally more than happy to experiment on dinner, when it comes to dessert comfort, familiarity and yes, even predictability are the order of the day. And I suspect I’m not alone. But the invention of avocado-based desserts is not the brainchild of the molecular gastronomy posse or even the delusions of left-wing tofu-cheesecake-consuming health nuts. In fact, as avocado-eaters go, around the world it’s those who confine them to savory preparations who are in the minority. Who would have imagined, gazing across their grilled chicken salads, their California BLTs and their dollops of guacamole, that avocados are eaten for dessert all over Asia and South America? Who would have suspected that the Brazilians blithely blend them into frothy batidos; that Filipinos mash them with sweetened condensed milk to make velvety puddings; that Indonesians innocently anoint them with sugary ice-cold coffee? Not me. But as I was utterly startled to discover that sweltering day in Bali, where I was overcome by the desire for something cold, sweet, and liquid, they really are delicious this way – and fully deserving of the very biological categorization I had never seen fit to agree with. Of course even with my avocado horizons broadened, I don’t have any plans to stop consuming them in all the savory forms I adore, and likewise at dessert time I doubt you’ll ever find me turning up my nose at good old chocolate and vanilla. But as I’ve happily discovered over the years, it really never hurts to have too many dessert options. …unless, of course, those options include tomatoes, peppers or eggplant! Notes: Rich and creamy drinks made from avocados and sweetened milk are classic ways of enjoying this fruit across Asia, and are really delicious once you get past any initial ‘this is weird!’ reaction. Watch out for over-ripe avocados, however, whose slightly rancid taste will spoil the drink. The best avocados to use are those that gently yield to pressure, that are free from dark blotches inside the fruit. If you have any doubts, taste a piece first. Also, I really love the citrusy note that a little bit of orange essence adds, but the avocado also has enough flavor to stand up on its own, or to other dessert flavorings like vanilla and dark rum. Or try a shot of espresso, as they like it in Indonesia. p.s. Did I mention this drink is rich? Combine everything in a blender and blend until very smooth (if you like you can add some of the ice here to give it more of a frosty milkshake character). Fill two glasses with additional ice. 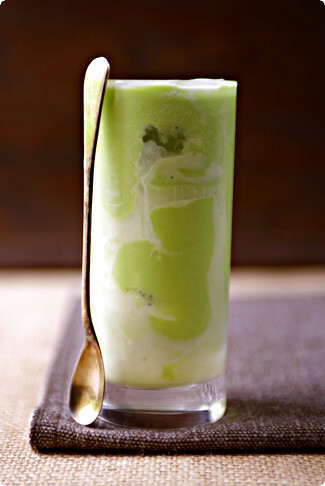 Drizzle a little more sweetened condensed milk over the ice before filling each with the avocado shake. Give it a quick stir and serve promptly, accompanied by a spoon.